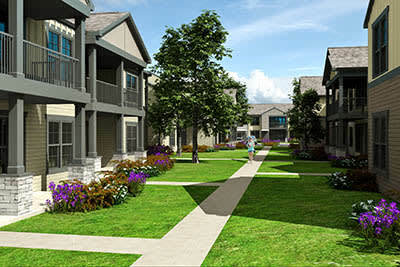 Experience the best of luxurious living in a townhome-style apartment at Springs of Sunfield. We offer studio, one, two, and three bedroom apartments for rent in Buda, Texas, that have been thoughtfully designed with modern touches throughout. Lofted, 9-foot ceilings expand your space upward and makes your entire home feel bigger. Fully equipped kitchens feature granite countertops and energy-efficient appliances in sleek stainless steel. Spacious walk-in closets keep your wardrobe organized, and your in-home washer and dryer simplifies laundry day. Our studio and one bedroom apartments are perfect for couples or solo residents, and our two bedroom apartments and three bedroom apartments offer more room to allow for children, roommates, or out-of-town guests. As a resident of Springs at Sunfield, you will enjoy exclusive access to the amenities of our gated community. Cool off in our sparkling swimming pool, or unwind with friends and neighbors in our community clubhouse. Work up a sweat on the state-of-the-art cardio and weight equipment in our 24-hour fitness center. And being a pet owner is never better than it is at Springs of Sunfield. Our on-site pet parks and pet spa area will keep your furry family members feeling good. Schedule a tour with a member of our team today. We can’t wait to show you what’s waiting for you at Springs at Sunfield.